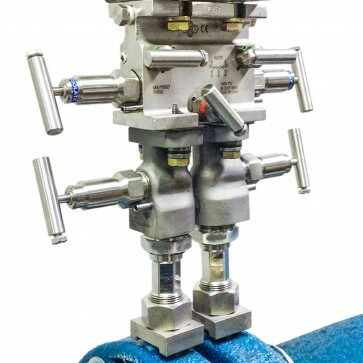 Parker PGI offers an extensive variety of connections with their close coupling manifold systems. Direct-Mount Systems can minimize or eliminate Gauge Line Error (GLE), resulting in more accurate measurement. Parker PGI’s offers a wide variety of connections for the Direct Mount Close Coupling Manifold Series. To better understand why you direct mount a manifold, let’s review the basics. First, pulsation created by compressors, flow control valves, regulators and some piping configurations may create unacceptable levels of Square Root Error (SRE) and/or resulting Gauge Line Error(GLE). Pulsation at the orifice meter is a major source of lost and unaccounted for natural gas, which can create large economic gains or losses for both buyers and sellers along a natural gas pipeline system. Industry studies have proven the existence of flow and/or pulsation-induced GLE in traditional, remotely tubed meter installations. Pulsation and resulting SRE creates a high probability that GLE is present within your measuring systems. These highly accredited studies concluded that transmitters or electronic flow meters (EFMs) should be close coupled to the orifice taps with equal length, large bore (0.375 inch I.D. or greater), constant diameter gauge lines to minimize or eliminate GLE. PGI’s patented Direct-Mount Systems (DMS) were developed in response to requests by leading gas transmission companies for a safe, efficient method of close coupling EFMs and transmitters to orifice fittings and thus eliminating or reducing the effects of Gauge Line Error from accurate measuring systems. DMS can be easily configured and safely installed for both vertical and horizontal to vertical applications. DMS reduces installation cost because there is never a need to manufacture and install time-consuming tube runs with expensive tube fittings and pipe stands. DMS is a flange to flange continuous connection that eliminates NPT connections and potential leak paths. Industry Leadership, Field Tested Performance PGI is the leader in innovative DMS technology. Since its introduction in 1988, thousands of Direct-Mount Systems have been installed worldwide. PGI’s DMS provides the most user-friendly, affordable installation available in the market.